I don’t think it works well. What’s wrong with using totem? Yeah, on 64bit karmic the app loads up but video fails to display. Have they fixed the dependency error? When I installed it it still needed me to “sudo apt-get install phonon-backend-gstreamer”. In order to get minitube to actuallt play its results. Other than that, I love it! 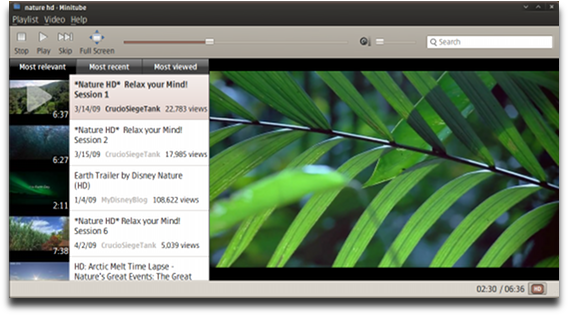 Firefox+Flash+Linux= stuttering sometimes, and I haven’t seen that issue with minitube even HD on fullscreen. Nice app, thanks to the developers. For some reason, this package needed to uninstall my nvidia 190.42-livdpau package. I did not happen to notice it needed to do this until the install was underway. Next time I logged on it was to a command prompt. Don’t be like me and check to see what packages are being removed when you install hardware. @Clapico: Did you try what I mentioned? Perhaps you can elaborate on what errors you’re getting? It installed on my Dell with Intel graphics without any problem. Seems like a nice way to browse for videos. There were a few pauses in longer videos. I assumed that was due to ‘buffering’. If the developer continues to work on it, it would be nice to have a feature to Save a video or email a link to it. @Clapico: Have you tried running minitube from the console to see any errors? Do you have ubuntu-restricted-extras installed? It may be a missing codec problem. Thanks a lot! Using this under SRSS 4.2 (Sun Ray terminal server) to deliver flash with sound (which I’ve found no way of doing otherwise under 64bit Ubuntu 9.10). Smart, and nice. Only thing I can think of as a needed feature is a way to copy the link to the original Youtube video? Again, a biiiig thank you!! How do I start minitube after install? ok I got it to work, just installing the version you said in this page daaaaah!! !